The jobs of 89 federal workers involved in estimating the budget impact of legislation in Congress would be eliminated under a proposal from members of the House’s upstart conservative caucus. 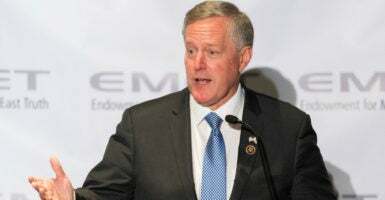 Rep. Mark Meadows, R-N.C., chairman of the House Freedom Caucus, said Monday that members would deploy an obscure rule that allows a House member to seek changes in an agency by offering an amendment during the budget process. Called the Holman rule, it dates to the decade after the Civil War, hasn’t been used since President Ronald Reagan’s first term, and was revived by House Republicans when the new Congress convened in January. Federal News Radio reported that the entire Budget Analysis Division of the nonpartisan Congressional Budget Office, comprising 89 employees and about $15 million in salaries, would be “abolished” under the amendment offered by Meadows and three other Republicans—Reps. Morgan Griffith of Virginia, Jim Jordan of Ohio, and Scott Perry of Pennsylvania. Meadows and the other three House members attached the amendment cutting the CBO to a so-called “minibus” of spending bills for fiscal year 2018 that includes defense, military construction, veterans affairs, energy, and water, according to Federal News Radio. The Holman rule “gives us the tool to go in and cut the funding without cutting an entire agency,” Meadows said in an appearance at the National Press Club. Cutting personnel at the Congressional Budget Office who “score” the cost and other effects of legislation such as the main House and Senate health care bills is where the caucus decided to begin, he said. The Freedom Caucus chairman said that independent CBO process could be replaced by aggregate scores of budgetary impact from think tanks, and he named American Enterprise Institute, Brookings Institution, The Heritage Foundation, and Urban Institute. “We ought to take a score from Heritage, from AEI, from Brookings … ,” Meadows said. Lawmakers, especially conservatives, long have questioned the CBO’s accuracy in predicting the costs and related consequences of legislation, especially predictions about Obamacare, formally known as the Affordable Care Act, and most recently proposals in the House and Senate to replace it. Some conservatives, for example, criticize the CBO for predicting more than 20 million Americans would “lose” health insurance, when eliminating Obamacare mandates in their view would allow millions of consumers to choose not to buy “one size fits all” insurance. Democrats assailed the move by Meadows and his Republican colleagues. The Holman rule empowers members of Congress to target individual federal employees. The rule is being used to punish an important advisory body for doing its job by providing forecasts which some members now find inconvenient. This is part of a strategic assault on objectivity and expertise in the civil service. Freedom Caucus members will talk about the proposal this week, Meadows said. Meadows also addressed the failure so far of Republicans either to repeal or to repeal and replace Obamacare, as they promised in four elections. As it turned out, the Freedom Caucus chairman said, individual caucus members realized the resulting legislation would “not be perfect” and they needed to show more flexibility to avoid a contrarian reputation. “We’re trying to make sure we give at least two alternatives for a solution,” he said. The caucus won some concessions in the final version of the House’s health care bill, but the Senate legislation so far varies markedly from it.